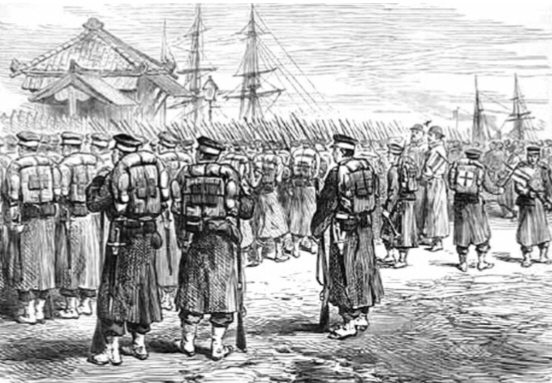 The Sacum rebellion and its last uprising near Kagoshima in the Battle of Shiroja on September 24, 1877. The last units of the Samurai of the Sacuma family and the units of the new imperial army, dressed in European style uniforms and armed with modern Western guns, stood opposite each other. When US Commodore Matthew C. Perry headed the squadron of the four Pacific Ocean Fleet squadrons, docking one beautiful July day in 1853 in the Gulf waters in front of the capital of Japan's Edo Empire, and opposed to the will of his rulers to open the hermit empire to the world, few people knew that the backward feudal country called Nippon will grow in a few decades a powerful regional power that once and for all will sweep away the years of traditional Asian power status quo defined by the geopolitical interests of European colonial powers and the United States. What's more, in a translated sense, it will shake the global hegemony of the "white race". The miraculously rapid expansion of the isolated island state triggered a forced confrontation of the East with the West, which at that time and with full force revealed contradictions that hitherto concealed the entire Japanese society, relying on medieval production relations and the caste system. Practically from day to day, it accelerated social changes, at the end of which a modern civilization, enjoying not only an unusual respect, but also an unceasing admiration, grew stronger, after the handsome, intelligent and educated young man with a visionary spirit, emperor Mucuhito. You can read more in the new issue of Plastic Planet 3/2018.